Leo is racing across the rooftops of New York, hoping to get back to April’s apartment with a fresh pizza before “The Magnificent Seven” is over. Unfortunately, he undergoes another one of the after effects from his recent time/space adventures and finds himself zapped to the world of Usagi Yojimbo yet again. Upon arriving, he spots his pal, Miyamoto Usagi, surrounded by a horde of Neko Ninja, demanding Usagi fork over a treaty. Leo leaps into action, much to Usagi’s surprise, scaring the Neko Ninja off (who vanish in a smoke cloud). Usagi explains to Leo that the Neko Ninja are agents of Lord Hikiji and scheme to overthrow the Shogunate. It seems that Lord Noriyuki of the Geishu Clan and Lord Fujitako of the neighboring province have been trying to negotiate peace for the following year. Lord Noriyuki has entrusted Usagi with delivering the treaty to Lord Fujitako. Lord Hikiji, however, wants to get his hands on the treaty so he can study its terms and plot a means to take advantage of them. As they walk and talk, Leo tells Usagi about his three brothers and his Master, Splinter. He goes on to describe New York City to the perplexed rabbit, who interprets the skyscrapers as great castles and presumes that Leo, being such a great warrior, must certainly live in the tallest one of them all. The flustered Leo has to humbly explain that he and his brothers used to live in a sewer. Regardless, Usagi would like to some day visit New York. During this discussion, neither notice that they’re being followed by a mysterious woman. Suddenly, a whirl of shuriken shower down on the pair, followed by a horde of Neko Ninja. Leo drops his pizza and a brawl ensues. The battle is cut short when a Neko Ninja grabs the mysterious woman and holds a sword to her neck, demanding Usagi fork over the treaty in exchange for her life. Reluctantly, Usagi hands it over and the Neko Ninja vanish in a cloud of smoke. Leo insists they can still catch the ninja, but Usagi casually tells him not to worry. The mysterious woman then removes her hat to reveal that she is Tomoe Ame, Chief Retainer of Lord Noriyuki and a good friend of Usagi’s. It turns out that Usagi was carrying a decoy all along and that Tomoe actually holds the genuine treaty. As Leo wraps his head around this, Tomoe picks up his trampled pizza box, disgusted by the quality of the contents within. Taking the pizza, Leo attempts to explain that normally it’s very appetizing, but before he can finish, the time/space effects wear off and he vanishes. Usagi remarks how much he hates it when Leo does that, while Tomoe informs him that he has very strange friends. Back in April’s apartment, the Turtles are a bit ticked that Leo’s taking so long with the pizza. Suddenly, he comes smashing through the window and lands face-first on the floor. Not only has he missed the entire movie and ruined the pizza, but now he’s broken April’s window. Leo tries to explain about the samurai rabbit to April, but once again, no one will believe him. *Leo last met Usagi in Usagi Yojimbo (Vol. 1) #10. They will meet again in Usagi Yojimbo (Vol. 2) #1. *Leo has been feeling after effects from his time travel adventure in TMNT (Vol. 1) #8, which first began in “Turtle Soup and Rabbit Stew”. 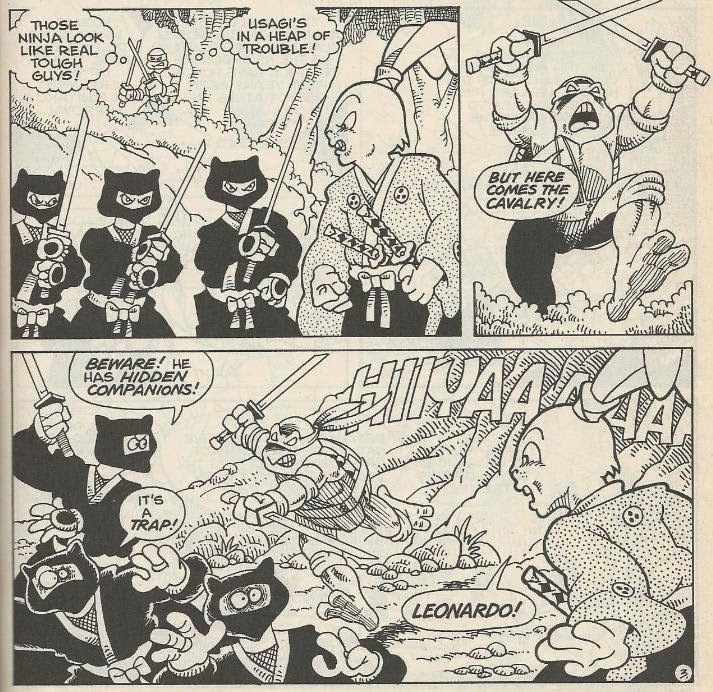 *For unknown reasons, "The Treaty" was originally skipped by Fantagraphics during their graphic novel collection series of Usagi Yojimbo issues. It was not reprinted until 2010, where its inclusion in the Usagi Yojimbo Special Edition hardcover collection was given special acknowledgement. *This story was reprinted alongside "Turtle Soup and Rabbit Stew" for the pack-in comic that came with the San Diego Comic Con 2017 Edition Usagi Yojimbo action figure. The comic used a colorized version of the pin-up from Tales of the TMNT (Vol. 2) #25 as the cover art. “The Treaty” is probably the most substantial TMNT/Usagi crossover we’ve gotten so far. 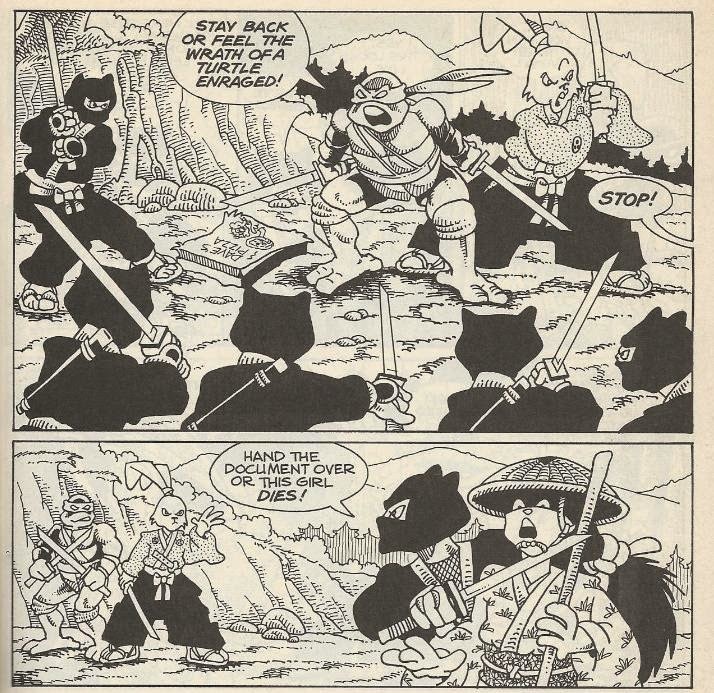 “Turtle Soup and Rabbit Stew” was just a six page gimmick to get the two characters on the same page, “The Crossing” was an excuse to have them fight, but “The Treaty” actually sees Usagi and Leo cooperating in an adventure (with a surprising amount of content and political intrigue for a mere ten pages). Sakai has a very cute art style that I have to admit I really like. It’s more “funny animal” than the Eastman/Laird “grim and gritty” take on the Turtles, but lends itself to dynamic action sequences far better than other “cuter” renditions of the Turtles I’ve seen. The battle with the Neko Ninja doesn’t really extend any further than a one-panel brawl, but I’d gladly swap out some additional action sequences for all the scenes of conversation between Leo and Usagi that we got, instead. It was amusing, watching Leo try to explain a modern metropolis to Usagi and then having to humbly tell him that he used to live in a sewer. 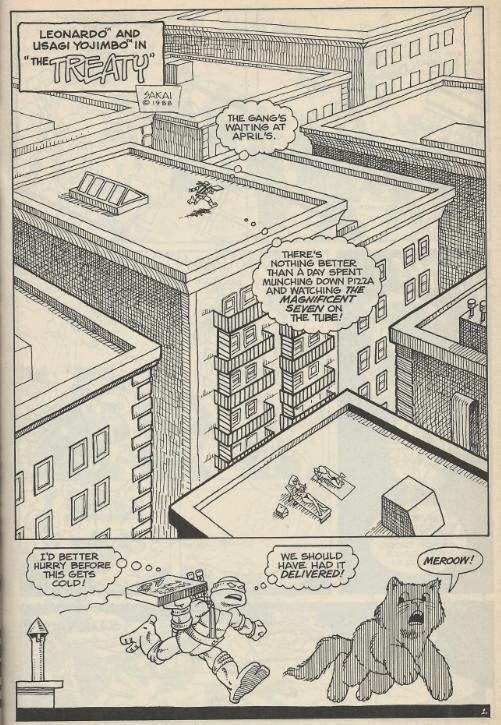 A shame Usagi never got to visit New York in any of the Mirage comics, but he ventured there twice in the Fred Wolf cartoon (“Usagi Yojimbo” and “Usagi Come Home”) and once in the 4Kids series (“Samurai Tourists”), so it’s cool. Though I’m not the most dedicated Usagi Yojimbo reader on the planet, I did recognize all the name drops for various characters from the series (Lord Noriyuki appeared in the 4Kids series episode “The Real World: Part 1”) and it was cool to see Tomoe pop up since she’s such an important supporting character in the comic. Anyhow, "The Treaty" was rather hard to come by for a while, due in large part to it having never been reprinted in any Usagi graphic novel collection. It finally go its due this year, being reprinted for the first time in the Usagi Yojimbo Special Edition hardcover collection from Fantagraphics. Unfortunately, that massive (and awesome) tome MSRPs at $100 bucks, so you might wanna save your pennies. "Shell Shock" may go for a bit cheaper on the aftermarket, but with the insane prices TMNT trades have been running on eBay, who can really say? Still, if you can get your hands on this story for a reasonable price, I would cheerfully say "go for it". The Treaty WAS published in graphic novel format by Fantagraphics. It is in the HC edition of Book 6.